I'm suddenly obsessed with pink peppercorns. Big deal, I hear you cry. I expect you've been munching them for several years. But even if you have, are they not a godsend? Peppery- yes. Strong in taste- sort of. Not really. Sweet- yes. Fruity- yes. And if you add them to a sauce, or as a garnish (sorry, dreadful word, but you know what I'm getting at) they can add an instant je ne sais quois to an otherwise bland dish. It's for an "Orange Viniagrette with Pink Peppercorns". I squeezed out the juice of an orange, and combined it with a teaspoon of white sugar, a splash of cider vinegar, a splash of water, a few grains of sea salt, fresh majoram leaves (picked off their stalks) and a handful of crushed pink peppercorns. The peppercorns are suprisingly mild, so it can take it. Put it this way, you can eat the peppercorns raw, and it's a pleasant "taste sensation". Visually, the pink peppercorns are also pretty- and that's important. I quite like the idea of warming this dressing up and drizzling it over braised fennel and sliced, pink-ish duck breasts. There's something extremely satisfying about "devilled" food. As you know, "to devil" a dish means to add some form of spice, often something like Worcester Sauce or a hot mustard. These days "devilling' is slightly old-fashioned; it has a hint of the 19th century about it, a whiff of a St James's Street club. 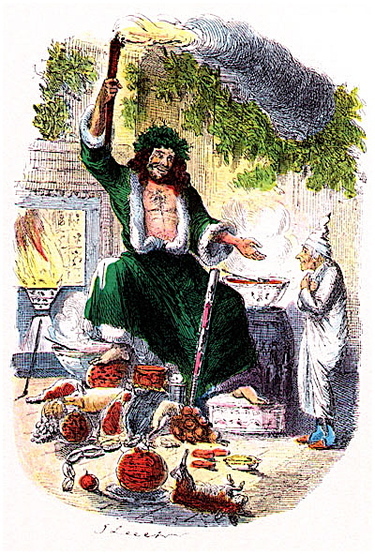 I happen to love the tangy, slightly sweet, piquant taste of Lea & Perrins (first produced in the English town of Worcester in 1837), and, like the Victorians, will quite happily devil just about anything, including ham, eggs, kidneys and mutton chops. Required: half a pint of clear brown stock...half an ounce of arrowroot, a tablespoonful of claret, a teaspoonful of French mustard, a dessertspoonful of Worcester sauce, and a little soluble cayenne, with salt to taste, and a few drops of soy. Mix the thickening with the claret, and the rest of the ingredients, and boil for a few minutes. Serve with kidneys, steaks, & etc., or with grilled fish. For a hotter sauce, increase the Worcester sauce, or boil a few capsicum seeds in the gravy." You melt 30g butter, and stir in 1½ tablespoons of flour, ½ teaspoon of English Mustard, and ½ teaspoon of Curry Powder. Cook this, stirring, for one minute. 275ml of milk is added, and 150 ml of double cream (both of which you've previously heated up together), and the sauce is stirred constantly on the heat until it starts to bubble. 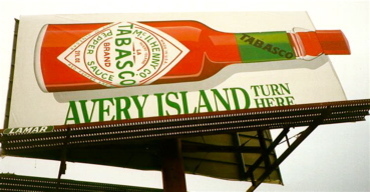 The sauce is then simmered gently for about eight minutes, until slightly reduced- and the remaining flavourings stirred in: ½ teaspoon of salt, a pinch of cayenne, ½ tablespoons of Worcestershire Sauce, ½ tablespoon of Mushroom Ketchup and, last but not least, a dash of our old friend, Tabasco. This will make a basic sauce, which can then be poured over an ingredient of your choice: grilled or fried chicken, boiled eggs, and game. I think it would also work well with slices of fresh, juicy ham. How often do you use an ingredient without really knowing anything about it? Step forward Angostura Bitters. I'm guilty of this myself. I specified its use in my recent Pink Gin post; I use it now and again in cooking. I've grown to appreciate its aromatic, almost piquant taste. I'm in favour of its deep reddish brown amber colour. But I'll admit to you that- until now- I couldn't tell you anything whatsoever about Angostura Bitters. I wasn't even sure what the stuff is made from. 45% Alcohol, Gentian Root, "Vegetable Flavouring Extracts"- whatever that means: the exact recipe is a closely guarded secret, with only five people knowing the precise recipe. The root of a plant found in Alpine regions. Gentiana verna. It has a blue flower. It also flavours Polish Zoladkowa Gorzka vodka. The House of Angostura, Tinidad and Tobago. Founded in 1830 by a German doctor, Johann Gottlieb Benjamin Siegert, Surgeon-General in Simon Bolivar's army in Venezuela. He experimented with bitters as a way of helping the digestion and well-being of his troops. "In 1830, Siegert exported his unique aromatic bitters to England and Trinidad. By 1850, he had resigned his commission in the Venezuelan army to concentrate on the manufacture of his bitters, which was enjoying a huge demand. In 1862 the product was exhibited in London, to great approval." I've heard a rumour that it contains Angostura Bark? Angoustura Bitters does not contain Angostura Bark. Instead, it's named after Angostura in Venezula. Why is the label too big for the bottle? Nobody really knows. One story points to the laid-back Caribbean attitude. An oversized label was ordered by mistake, and no-one bothered to correct it. The portrait of Emperor Franz Joseph I of Austria appeared on the label after Angostura won a medal at the 1873 World Fair in Vienna. You're in good company: The King of Prussia, King Alfonso XIII of Spain, King George V, King Gustav VI Adolph of Sweden and HM The Queen. Perhaps. A remedy for hiccups and an upset stomach, and- just possibly- a cure for hangover. Tags: angostura bark, angostura bitters, angostura bitters ingredients, angostura cocktail, angostura cocktail ingredient, angostura history, angostura tobago, angostura trinidad, angostura venezuela, bitters recipe, cocktail history, cocktail ingredient, house of angostura, orange bitters, what is angostura bitters? Last night I dreamt again of Chicken in a Black Bean Sauce. Nothing special, just the ordinary, slighty tacky dish you get delivered from a Chinese takeaway, the sort of thing you might eat with chopsticks in front of the television, straight from the tin-foil carton. Strips of chicken, bound in a starchy, slightly piquant, peppery black sauce, stir fried with crunchy green peppers. 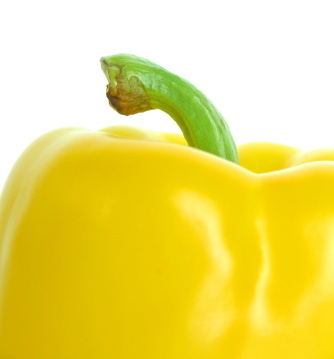 Always crunchy green peppers. As with Indian food in this country, I expect that Chicken in a Black Bean Sauce is about as authentic as a pizza cooked with pineapple; not of course that I am recommending you add pineapple to your pizza; that would be a heresy. But just sometimes, there's something comforting about re-creating simple, bastardised dishes: I think they've become modern classics in their own right. First, you will need to make up your own black bean sauce mixture. In a bowl, combine the following ingredients: two heaped tablespoons of Chinese fermented black beans (rinsed and mashed), two cloves of minced garlic, one tablespoon of dark soy sauce, one teaspoon of Chinese oyster sauce (from the bottle), one teaspoon of sugar, two teaspoons of cornstarch, 1/2 cup of chicken stock, and a dash of rice wine or sherry. Put to one side. Heat up your wok over a medium heat, and add a dash of toasted sesame oil. Warm for about thirty seconds. Add a teaspoon or so of minced garlic and your home-made black bean sauce. Cook, stirring for thirty seconds. Add some chicken (which you've previously cut into thin strips) and cook through. If the sauce gets too thick (or there's not enough of it) add some more chicken stock or water. Cook, stirring occasionally so that the sauce doesn't stick to the wok. When the chicken's almost cooked, add diced onion, sliced spring onions, green pepper (cut up into chunks), a further generous dash of soy sauce (this will help to turn the sauce a darker colour) and lots of fresh black pepper. Cook quickly (so that the vegetables are still crunchy) and serve. Steamed rice would be just the ticket. I tried these the other day and thought they were good. They're "Improved Recipe Original Organic Free Range Chicken Stock Cubes" by Kallo; gluten and lactose-free, too- whatever that means. No Monosodium Glutamate (boo hoo! ), artificial colours, flavours or preservatives. If you can't be bothered to brew up your own chicken stock (we do this on a regular basis, and freeze it), this could be your answer. They've got an intense chicken flavour and, in my opinion, are most certainly better than the good old Knorr's version- unbelievably championed by than none other than one Marco Pierre White of infamous Wheeler's fame. I once had dinner with a pair of sophisticated Italian sisters in Milan. They had a thing about "Mr Knorr" (along with the American Campbell's soup) which they seemed to think was the height of retrospective British cuisine. What they didn't realise is that Knorr, in fact, is a German brand, now owned by the Anglo-Dutch corporation, Unilever. And, no- I haven't got shares in Kallo, or had temptation dangled in front of me by some eager PR girl. This is a genuine recommendation. You know, there really isn't such a thing as a brand new recipe. It's all been done before. The other day, I "invented"- or at least, thought I did- a delicious new piquant sauce based on the licorice flavours of tarragon, combined with the creamy, slightly sugary floral flavour of vanilla; and hey presto! I see that one of the top 50 restaurants in the world already has it on their menu. Shucks. I think it would work brilliantly with chicken, and perhaps, even better with a meaty fish, monkfish, perhaps- even salmon? Before I tell you how I made it, here's a brief look at the two main ingredients, tarragon (Artemisia dracunculus) and vanilla. I'm quite keen on growing herbs in our London garden (sometimes it's an uphill struggle), but I've never managed to grow tarragon properly. I gather this is a difficult one. Rather splendidly, Tarragon also goes under the alternative name of "Dragon's Wort". The serpentine shape of tarragon's roots made herbalists believe that it could cure snake bite, hence the Latin "dracunculus", meaning "Little Dragon". There are two varieties of tarragon, French and Russian. Russian tarragon is easier to grow but doesn't taste as good as French tarragon. Vanilla comes from an orchid native to Mexico and after saffron, is the second most expensive spice in the world. The Spanish word "vainilla" means "little pod". Originally cultivated by Pre-Columbian Mesoamerican peoples, the Spanish conquistador Hernán (or Hernando) Cortés is credited with introducing both vanilla and chocolate to Europe in the 1520's. Melt some unsalted butter in a smallish pan; chop up about three of four shallots and sweat them gently in the butter. Turn up the heat and add a generous slug of a dry vermouth such as Noilly Prat (rhymes with cat). Bubble away to burn off the alcohol. Add a dash of balsamic white vinegar and let the sauce bubble for a minute or so. Next, pour in some decent chicken stock, add a scraped out vanilla pod and seeds, and a handful of chopped tarragon leaves. Reduce on a high heat, until the broth is reduced by about half- and starts to thicken. Strain through a seive into a new, clean and cold pan, discarding the tarragon leaves, vanilla and shallots. Alllow the sauce to cool down for a few minutes. Very carefully (so that it doesn't curdle) mix in a small tub of double cream. Turn your stove up to a high heat and reduce (with only the very occasional stir) until the sauce is reasonably thick. Check the seasoning and if necessary add some Maldon Sea Salt and White Pepper. For that extra vanilla kick, you could always substitute the Maldon Salt with a pinch or two of Vanilla Fleur de Sel, the delicious (and expensive) vanilla flavoured sea salt you can buy from French delis. Stir in some freshly chopped tarragon leaves. Warm through and serve. This sauce is really about four flavours: aniseed (from the tarragon and the vermouth), vanilla, salt and the sweet-sharp taste of balsamic vinegar. I think it works, and I like it. As promised, here's a recipe for the classic Béchamel Sauce. In England it's known as a "White Sauce". According to the Larousse Gastronomique, the sauce is named after the "Marquis de Béchamel, Marquis de Nointel (1630–1703), a financier who held the honorary post of Chief Steward to Louis XIV. Béchamel is an improvement upon a similar, earlier sauce, the Tuscan "salsa colla", imported from Italy to France by Catherine de' Medici. It first appeared in "Le Cuisinier François", published in 1651 by François Pierre La Varenne (1615–1678), chef de cuisine to Nicolas Chalon du Blé, Marquis d'Uxelles. The Escoffier method is considered to be definitive: make a white flour butter roux from equal parts of unsalted butter and flour, i.e. melt a big knob of unsalted butter in a hot small pan, and stir in an equal measure of flour. Next, gradually whisk in hot milk. As the flour cooks, it will form a smooth sauce. Season with sea salt, add an onion studded with a clove, and cook for eighteen minutes. A certain George LaLonde Jr., fisherman of Clayton, Upstate New York, hosted guided fishing parties, which included a group "shore" lunch as part of the day's attraction. It was at one of these fishing lunches, that the actress and cookery writer, Miss May Irwin, first tasted the "unusual" (then un-named) dressing, made to Mrs LaLonde's own special recipe. May Irwin liked it so much that she asked for the recipe, named it "Thousand Island Dressing", and passed it on to the owner of the Waldorf Astoria Hotel, George C. Boldt, who in turn, instructed his famous maitre d', Oscar Tschirky to serve it in his restaurant. Have you noticed how Oscar Tschirky seems to crop up every time I write about American food history? Tschirky sounds like a bit of a live-wire, and seems to have been credited with not only the creation of the Veal Oscar, but also the Waldorf Salad and Eggs Benedict. Either that, or he was a brilliant self-publicist. Anyway. I've trawled the net for the original recipe- and of course, as with so many "classic" dishes, there are many different versions. Here's my reasonably authentic take on it. If any readers (especially from the Thousand Islands area of Upstate New York) want to give us their own "proper" recipe, please hit that comment button now. Make a good mayonnaise, preferably using grapeseed oil and a touch of olive oil. Mix in a generous spoonful of tomato ketchup, a dash of Worcestershire Sauce, a teaspoon of white sugar, a dash of white vinegar, a pinch of ground cloves, a dollop of sweet pickle or relish, chopped black olives, a small diced red bell pepper, some chopped chives, and a sprinkling of chopped hard-boiled egg white. Season to taste with sea salt and white pepper. One of my favourite restaurants in New York is the Grand Central Oyster Bar. I've always found this place a bit incongrous, and those of you who have been there will know what I am talking about: it's a labyrinth of sparkling marble and mosaic tiled rooms, decorated in the Byzantine style, and built directly underneath the station, offering an extensive choice of oysters from every shore in the United States. And with the oysters comes a spicy horseradish and tomato sauce (or ketchup), served up in those little paper cups. You'll also find this sauce in American diners. I've noticed that some Americans just call it "horseradish sauce", which is slightly confusing as it's red in colour, and quite clearly contains tomato; while here in Perfidious Albion, "horseradish sauce" is the creamy stuff we serve with the roast beef of Merry Old England. You say tomato, we say tomarto, let's call the whole thing off. Here's a good (if slightly lengthy) way to make your own version. I've based it on Simon Hopkinson's wonderful book Week in Week Out, which is currently The Greasy Spoon's "Book of the Month". The secret lies in making both the horseradish concentrate and the tomato juice ahead of time, and then keeping both of them in the 'fridge. The horseradish concentrate can also be used for English style creamed horseradish sauce and delicious horseradish mousse. The homemade tomato juice can be used for mixing Bloody Mary's. First you need to make a homemade horseradish concentrate: Grate 200g of peeled horseradish root into a food processor and add five tablespoons of water, two teaspoons of Maldon Salt, 1 ½ tablespoons of caster sugar, 2½ tablespoons of lemon juice and 2½ tablespoons of white wine vinegar. Make sure you peel the horseradish and then grate it across the base of the root. Whizz it up in the food processor until smooth, and then tip it into a Kilner jar (it should keep in the 'fridge for up to two weeks). Next, you need to make a homemade tomato juice: take 1kg of very ripe tomatoes and core and cut them up into quarters. Put them in a large pan. Add a heaped teaspoon of Maldon Salt, a tablespoon of caster sugar, and 125ml of water. Cover the pan and warm on a lowish heat for about twenty minutes. You want the tomatoes to wilt. There should also be quite a bit of tomato juice floating around in the pan. Pour the contents into a vegetable mill (mouli-légumes) and grind it up. (It's really worth investing in an authentic mouli-légumes, and I've included a link to buy one from amazon uk. It's a decent bit of kit and indispensable if you are going to make your own purées, sauces and soups. Leave the tomato juice to cool, and stir in a tablespoon of horseradish concentrate. Let it infuse for about ten minutes and then pass the sauce through a sieve. That make's a basic tomato juice. To make the ketchup: take 300ml of the tomato sauce and reduce it in a small pan, until it thickens up. Remove it from the heat, let it cool down and stir in two tablespoons of the horseradish concentrate. Chill in the 'fridge. Perfect with oysters. We've got two corn-on-the-cobs left over in our weekly Abel & Cole vegetable box, and I was racking my brains thinking what to do with them. Last year I invented a rather good sweetcorn relish- which was very similar to the stuff you used to be able to buy in jars. It's white trash diner food, and I like it. 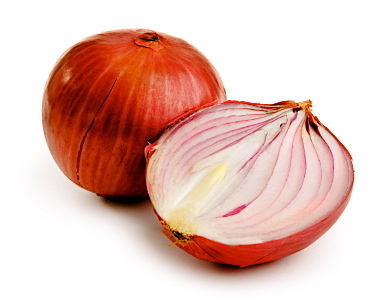 Chop or slice up some shallots and fry them in grapeseed oil. Next, tip a tin of sweetcorn (or better still, some fresh cooked sweetcorn) into a bowl, and mix in some diced green and red peppers, a dash of white vinegar, a spoonful of sugar, and a teaspoon of garlic powder. Season with sea salt and white pepper, and finish off the job with a spoonful of starchy cornflour. Add the cooked shallots to the mixture and heat up the thing slowly in a small pan, so that the cornflour cooks properly. The finished result was cotton pickin' authentic. Perfect with burgers, even better with fried chicken. I rest my case. I've just heard Alasdair Scott Sutherland talking about his interesting new book on BBC Radio London. It's called The Spaghetti Tree: Mario and Franco and the Trattoria Revolution and looks at the growth of Italian restaurants in Sixties London, and in particular, the careers of Franco Lagattolla and Mario Cassandro; former waiters at The Mirabelle who opened the starry La Trattoria Terrazza in Romilly Street, Soho, in 1959; subsequently patronised by the likes of David Bailey, Michael Caine and Princess Margaret (I'm finding that "Princess Margaret ate here" is fast becoming a favourite mantra). 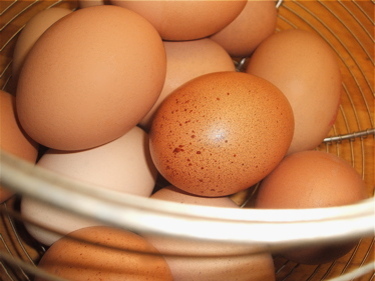 "Soak two tablespoons of fresh, white breadcrumbs in vinegar and then squeeze them out. Work one hard-boiled egg yolk to a paste, mix together with the bread and add four tablespoons of very finely chopped parsley, one finely chopped garlic clove and one teaspoon of chopped capers. Blend in one cup of olive oil. Season with salt and milled black pepper. If necessary, sharpen with a little more vinegar. Let this piquant sauce stand for at least one hour." 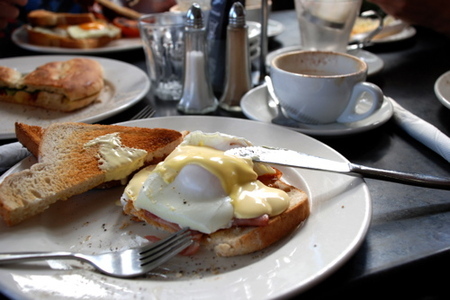 One of the fun things about writing The Greasy Spoon is thinking up new ways of describing the various tastes. On wikipedia ("it's in wikipedia so it must be true) Sage (Salvia officinalsis) is described as having a peppery taste. I'm not sure that's right? I've been a bit off-colour for the last week (with what women call "Man Flu") and The Girl (God Bless 'Er) cooked me up a divine chicken stew laced with copious amounts of sage. The sage and chicken combination worked well. with the velvety, aromatic, oniony and slightly sweet flavours of the sage helping to create a rich, smooth sauce. Traditionally, sage was used in the cooking of Merrie Olde England. It works well with pork, beautifully in stuffings, is the perfect match for onion and an essential ingredient in bread sauce. I love it. Here's my recipe for bread sauce. In England, we serve bread sauce with game, such as partridge or pheasant. It really is the genuine taste of this country, with the rather Medieval flavours of sage, nutmeg, mace and cloves. It's also a good 'un with poultry. Some strange people out there like their sauce thick. Personally, I prefer my bread sauce to be a bit sloppy. Add the following ingredients to a saucepan: 300ml milk, 50g butter, a chopped small onion, a crushed garlic clove, a bayleaf, two cloves, a blade of mace and some chopped fresh sage. Heat. Once the mixture is warm, stir in 75g of fresh white breadcrumbs and cook until thick and smooth, stirring the whole time. When you're happy with the consistency, remove the bay leaf, mace and cloves, and pour in 150ml of single cream. Adjust the seasoning with salt and pepper and grind in a decent amount of nutmeg. Reheat the sauce, but to stop it going thick- mix in a knob of unsalted butter and some more milk, to taste. Still on the subject of sage, a simple Italian sauce I'm rather fond of is Sage and Butter Sauce. This is just butter, heated until it turns a golden noisette colour (ie not burnt), lots of fresh chopped sage, salt and pepper and a decent squeeze of lemon juice. Very simple. I like it. At Dotheboys Hall, I remember being fascinated by an ancient copy of Hobson Jobson which I found hidden away on a dusty shelf in the school's Victorian Gothic library. First published in 1903, Hobson was an etymological glossary of Anglo-Indian words and language. A study of words such as Pajama, Veranda, Bungalow, Tiffin, Kedgeree and of course, our very own Curry. Anglo-Indian food is another fascinating study, in its own right. One of the best books on the subject is David Burton's The Raj at Table, published by Faber & Faber. Here's a recipe for Colonel Skinner's Mango Chutney. Today, there are various brands out there using this name. Actually, Colonel Skinner's Mango Chutney is something that you will find in the old Anglo-Indian cookery books and the original recipe involved leaving the chutney outside in the backyard to fester under the hot sun for a few days. I tried to find out who the original Colonel Skinner was (sounds Irish? ), but without success. Chop up the following ingredients in your Magimix or otherwise trendy food processor: twelve ounces of dried mangoes, half a pound of brown sugar, ginger, raisins, chillis and garlic to taste. Once they're chopped up, spoon the mixture into a large preserving pan. Add two and half pints of vinegar and season with salt. Bring to the boil and simmer for an hour. Transfer into sterlilised jars and store in a dark cupboard. I don't think I've yet written about the ubiquitous avocado. It's hard to remember, but not that long ago, avocados were seen as exotic and sophisticated and usually known as avocado pears. Nowadays, of course, they're all over the shop, and probably seen as a little bit passe; the staple fodder of dubious bistros and pretentious, second-rate restaurants. So, I've decided to have a closer look and see if there's more to them than initially meets the eye. The avocado (Persea americana) (from Nahuatl Aguacatl: agua-kah-tl), is native to Mexico, Central and northern South America, and classified in the flowering plant family Lauraceae. Avocado trees were cultivated in pre-Incan settlements with archeological evidence dating to 750 B.C. 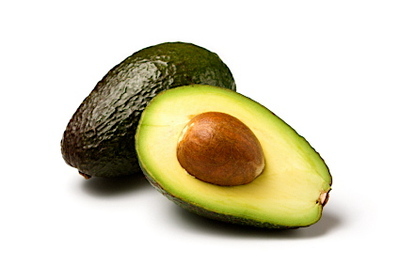 The avocado of choice is the Hass variety, which grows in California. That's the one with the dark green knobbly skin (pictured above). It has a lovely, creamy, nutty taste and is, in my opinion, superior to the smooth skinned varieties. Avocados are full of fat, but the good news is that this fat is a monounsaturated fat, which is supposed to be good for you. One of the best things you can do with avocados is to make guacamole. Originally an Aztec dish, it's easy to make, and goes brilliantly with things Mexican. Here's my own recipe for it. I prefer the texture to be a bit chunky, rather than completely smooth. In a bowl, half-mash up some hass avocados and then gently fold in red tomatoes (chopped into small pieces), a minced red onion, lime juice, finely chopped red chili, sea salt, a dash of Tabasco sauce, paprika, black pepper and some chopped fresh coriander. And finally, a useful tip: when preparing avocados, immediately sprinkle the exposed flesh with lemon juice. This will stop the avocado turning brown. Red Onion Marmalade is one of those retro things, beloved of late 70's and early 80's Bistro's. 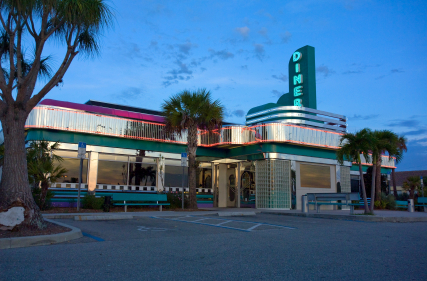 You know the sort of place: black and white photographs of Greta Garbo, candles dripping wax stuffed into old wine bottles, rickety tables with red and white check tablecloths, 30's dance music on the hi-fidelity system hidden beneath the bar. Come to think of it, there aren't many of these places left now in London. I can think of Grumbles in Pimlico (a relic of the 60's, I think), and that Polish/Mexican place in Shepherd's Market, but that's about it. Slice up some red onions thinly, and cook them in a pan with some butter, and some sugar. You want them to caramelise, so let them cook right down. The sugar will help them to go a dark brown colour. Next add a teaspoon of red wine vinegar, some mustard seeds, a teaspoon of redcurrant jelly, and a generous dash of port. Let the "marmalade" bubble away, until the liquid has more or less evaporated. Season with generous amounts of salt and black pepper. Remember Egon Ronay? He was that rather dapper Hungarian who published a series of restaurant guides, in vogue a few years back. One of the favourite books in my modest cookery library is none other than Egon's "The Unforgettable Dishes of My Life', published back in 1989. You should be able to get hold of a copy relatively easily from either amazon.co.uk, or that marvellous antiquarian book website, abebooks.com. His book's a personal thing, with lots of unpretentious recipes that have held some meaning to him over the years. That's something I like about food: the way a certain dish can bring back memories, or have some literary or historical connotation. Without getting too pretentious; wasn't that, in many ways, what Proust was all about? You know, the madeline dipped into the lemon tea and all that? Anyway, here's his recipe for Roast Red Mullet with Cumin Sauce. 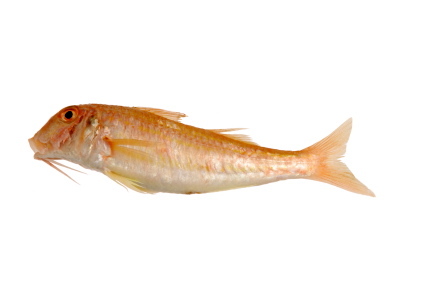 I've posted a picture of the critter above, so that you can recognise one when you go to your local fishmonger- if you have any left in your neighbourhood that is; in London, they're all more or less gone, and have been replaced by Starbucks, Gap, and various other chains of a dubious sort. Clean and gut a red mullet, keeping back the bones and the livers. Cut off the heads and the tail. Put the heads, tail, and bones into a saucepan, and add leeks, shallots, white wine, and salt. Pour in two pints of water, and bring to the boil. Skim off the scum as it floats to the top. Cover the saucepan, and simmer for about twenty minutes. Hey presto! You will have a fish stock. Reduce 3/4 pint of this fish stock, first adding two teaspoons of cumin seeds, until the stock takes on a syrupy consistency. Add half a pint of double cream and the Red Mullet livers, and boil for fifteen seconds. Liquidise in your magimix or blender, and then pass it through a sieve. That's the sauce finished. Brush the cleaned mullet with oil, and wrap it in foil, first seasoning it with a generous amount of sea salt and chunky black pepper. Place the fish on a baking tray, and cook in the oven at 220C (425F) until the fish is cooked. The flesh will flake slightly when it is done. Arrange the cooked fish on a plate, and pour the sauce around it. Eat. Do you like genuine horseradish sauce? By that I don't mean the stuff you get in jars from the supermarket, but instead the real, home-made version. Horseradish (Armoracia rusticana, syn. Cochlearia armoracia) is a perennial plant of the Brassicaceae family, which includes mustard, wasabi, and cabbages. Horseradish was cultivated in antiquity, and, according to Greek mythology, the Delphic Oracle told Apollo that the horseradish was worth its weight in gold. 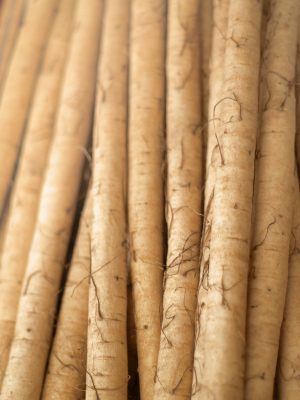 The photograph shows horseradish roots. You eat the roots, not the green leaves of the plant. You should be able to buy a root from your local grocer, or if you are lucky enough to have one, a farmer's market. Here's my recipe to make a classic English horseradish sauce. It goes well with beef, and smoked fish, like eel and mackerel. Clean and peel a horseradish root. Grate about two heaped tablespoons of the prepared root into a mixing bowl. Add a dollop of English Mustard, a dash of white wine or cider vinegar, salt, pepper, and sugar. Whip up a quarter of a pint of cream, and mix it carefully with the other ingredients. Last night I went to an almost perfect Indian restaurant. It's called "Hot Stuff" and can be found in the Vauxhall area of South London. Why was it so good? It reminded me a bit of the local restaurants you find in France. Utterly unpretentious, a simple menu; an affable, slighty quirky owner, and most importantly, excellent properly cooked food. It's a tiny place, with only a few tables, and as it seemed to be packed out, you will need to book to get in. 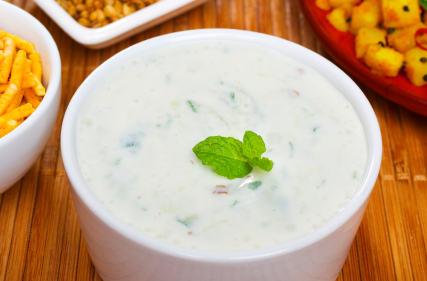 Here's my version of the Cucumber and Mint Raita Sauce we had last night. It would be perfect with poppadoms. Get hold of some yoghurt and beat it with a fork until it's smooth and creamy. Next, add Maldon Salt, black pepper, cayenne pepper, and ground cumin. I suggest that you grind the cumin yourself. In a frying pan, dry-roast some cumin seeds until they start to pop about. Make sure you don't burn them. It will only take a minute or so. Then it's an easy matter to grind them up into a powder in a pestle and mortar. Add some chopped chili, ginger, some diced cucumber (remove the skin though, otherwise you will get nasty miniscule bits floating around in the finished effort), and finely chopped fresh mint. It would probably be a good idea to whizz the whole thing up in a Magimix, or a similar mixer if you've got one. That's it. This is a quick and easy thing I invented yesterday, and it worked out perfectly. First, I steamed two yellow peppers until they were cooked (first removing the inner pith and seeds with a sharp knife) and then peeled off the skins, so that only the soft yellow flesh was left. Next, I whizzed up half a red onion in the trusty Magimix, together with a red chili (though, of course you could also use a green one), and two cloves of garlic. Once they had all been thoroughly chopped up, I added the yellow pepper flesh, and using the "pulse" button combined the ingredients carefully. You don't want the peppers to break down too much. Then it was a simple matter of adding fresh lime juice, lots of Maldon Salt, and a good quality Extra Virgin Olive Oil. It would work brilliantly with cold beef, and the yellow colour is interesting. The sweetness of the peppers balances out well with the sharpness of the lime. Try it, and I don't think you will be disappointed. I hope- pray even- that this Christmas you are going to make some genuine, home-made gravy. I know that some poor souls out there skip this, and make that stuff straight from the packet. And I loathe that. Starchy, synthetic, a nasty brown colour, gloopy- quite horrible. Ruins everything else on the plate. What is gravy? I had a few protest emails when I had the temerity to suggest that "gravy' in the United States, is what we call a white sauce. Ok, ok, I realise now that this is a term from the Deep South, and that some of you up on the East Coast have a similar thing to us in Britain. Serves me right for hanging out with a bunch of wannabe Confederates. Proper gravy (or jus, if you live in Hampstead) should be thin (I can't stress that enough), and made from the juices left over from your turkey, beef, or joint. Once the meat has cooked, lift out your joint, and let it rest. You will have the oven pan left over with the meat juices left behind, and probably some caramelised burnt bits as well. Pour off the surplus fat floating on the top. Over a moderate heat, stir in a small bit of flour, so that it soaks up the juices, and let it cook for a bit. It's now time to deglaze the pan. This means adding liquid to soak up the burnt bits left on the bottom of the pan. You can use wine, or stock- or a combination of both. For stock, I normally use the water left over from any vegetables that you are cooking at the same time. If you're making a light coloured gravy, say for chicken or turkey, I would use white wine. If you're making a darker gravy for beef, I would use a red, say a Beaujolais. Let it bubble away, and then finish it off with a tiny splash of soy sauce. This adds a bit of colour, and intensifies the flavours. 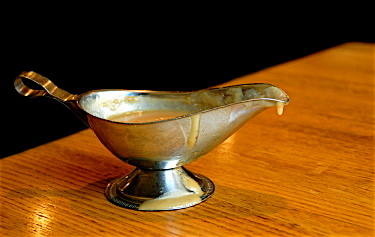 Strain off the gravy, and serve it in a sauce boat. I prefer my gravy to be very thin, light as well, and it's important when you serve it, not to let it swamp everything else on the plate. Apart from that, it's all pretty straightforward. Good Luck! One of the best English Christmas traditions is the Christmas ham. As well as turkey or goose, many families order in a York ham- dry cured and matured over a period of at least ten weeks. Let's be honest: it's probably more delicious than the turkey, especially when cut into impossibly thin slices and served on your plate with Cumberland Sauce. I'm sorry America, but Cranberry Sauce looses hands down in the Christmas sauce stakes! English Cumberland Sauce is infinitely preferable. And I would love to persuade you to give it a shot this year, instead. Try it out- and report back. This is how you make it: Peel of the skin of an orange, and then cut the skin into julienne (ie very thin strips). Put the orange strips into a pan with some water and bring to the boil. This will remove any bitterness from the orange peel. In another small pan, melt four heaped tablespoons of redcurrant jelly, with a teaspoon of ground ginger. Stir well, until the redcurrant jelly and the ginger have combined. Redcurrant jelly is best described as a smooth English jam (made obviously from redcurrant berries) which we normally eat with lamb. 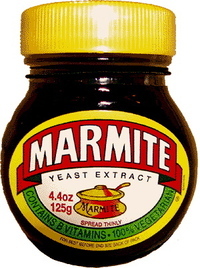 It's available ready-made in jars- though I have to admit, I'm not sure if it's easily obtainable in America; so you may have to track it down on the internet, or see if you local deli stocks it. The redcurrant jelly will act as a thickening agent, but true Cumberland sauce should really have a thinnish consistency, so try to keep it reasonably thin- if it coats the back of a spoon, you know it's about right. Next, pour in a decent slug of port, and the juice of one orange, and half a lemon. Stir well, then add the blanched orange strips, which you've taken out of the hot water, and drained. Hallelujah! I've been converted to the Mushy Pea cause. Like my bizarre loathing for mashed potato, until a few days ago, I didn't like them- or thought I didn't like them. But now all that has changed. Okay, I tucked into an upmarket version, probably petis-pois, half-mashed, and cooked in butter, stock and a bit of mint. But they were good- immensely good. The best fish and chips I've ever had was at some sort of ramshackled greasy spoon on the windswept coast of Whitby, in the North East of England. Whitby is an interesting place. First, there's this remarkable Gothic ruin of an Abbey, and then it's the place where Count Dracula first arrives from Transylvania in Bram Stoker's creepy novella. The secret of Fish and Chips is the batter. A traditional English batter is suprisingly simple. It's just sieved self-raising flour mixed with beer, and a pinch of salt. That's it. Nothing more, nothing less. The batter has to be extremely thick, mixed almost to a gluey consistancy. 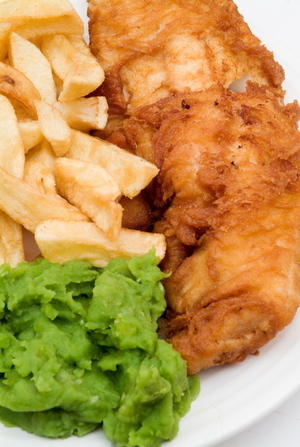 The fish (say, Haddock, or Cod), is then coated in the thick batter, and deep-fried in beef dripping or lard. The batter souffles, and the fish steams within the batter. Traditionally, English chips are cut into thick chunks, and that's the way many people in this country like them; though I have to admit that I prefer the French way of doing things, where the potatoes are sliced into thin strips and then double fried, but for genuine authenticity, thick-cut is the way you do it. Serve the whole shooting match with mushy peas, tartare sauce, malt vinegar and salt. Tartare Sauce is made from a combination of mayonnaise, chopped capers, gherkins, garlic, parsley, and shallots. In a later post, I'm going to get my thinking cap on and come up with the definitive version of this versatile sauce. Mayonnaise is easy to make. I'll repeat that. Mayonnaise is easy to make. I don't know why some cookery writers make such a big deal about it, but if you follow The Greasy Spoon method, you'll soon be whizzing up a decent mayonnaise in no time at all. First, break two egg yolks into a mixing bowl. Add a teaspoon or so of mustard (in this case, I prefer to use a milder type such as Dijon), some salt, and a splash of lemon juice or vinegar (French wine vinegar or cider vinegar is good). With a wooden spoon stir these together until they bind. Now's the time to start adding your oil. I'm now going to let you into a secret. Grape seed oil is a miraculous ingredient. First, it's good for you. Secondly, it's light. Thirdly, it's a brilliant binding agent for making emulsions- you need far less of the stuff to make your mayonnaise go thick, and that's a good thing. I've noticed that The Fat Duck at Bray uses grapeseed oil to make mayonnaise- and they use it for a reason. You could, of course, use only olive oil, but when I've made it that way in the past, the mayonnaise becomes, in my opinion, a bit heavy and also bitter. If you can't get away from the olive oil trap, add a tablespoon or so towards the end of the mixing. Now, this is the stage where if it's going to go wrong, it's going to go wrong. It's essential to pour in the oil in small batches, otherwise, your mayonnaise might curdle. The goal is to form a smooth emulsion. Carry on pouring in the oil bit by bit, stirring at the same time. Once you've got your emulsion up and running, you can start adding the oil in a steady stream. Keep stirring. The more oil you add, the thicker it'll get. Towards the end of the process, I like to switch over to olive oil for the extra flavour. Anyway, you'll eventually end up with a thick, jelly-like mayonnaise, that you can plunge a spoon into upright, and it won't fall over. That's a sign that your labours are finished. I'm now going to let you into a secret. Stir in a tablespoon of boiling water to your finished mayonnaise. The effects are nothing short of miraculous. You will end up with a light, fluffy, creamy mayonnaise, which is slightly lighter in colour too. So there you are. You can also break all the rules, and mix up a decent mayonnaise in your food processor, using the above method, though, in practice, I find it best to use three egg yolks, as the food processor method tends to make a much thicker sauce. Oh, and if you leave your mayonnaise in the ' fridge, it'll get even thicker. Spread the word.